olive oil | Happiness is a warm oven. Jamie served this as a bruschetta. Instead, I just sliced ciabatta rolls in half and toasted them. More of an open faced sandwich than proper bruschetta. Sorry for the crappy pictures. Smash the olives and tomatoes in a bowl. Add oil, vinegar, basil, oregano, and salt and pepper. Refrigerate for awhile. Toast ciabatta bread. Rub a garlic clove onto the toasted bread. Top the bread with the salad and some mozzarella cheese. 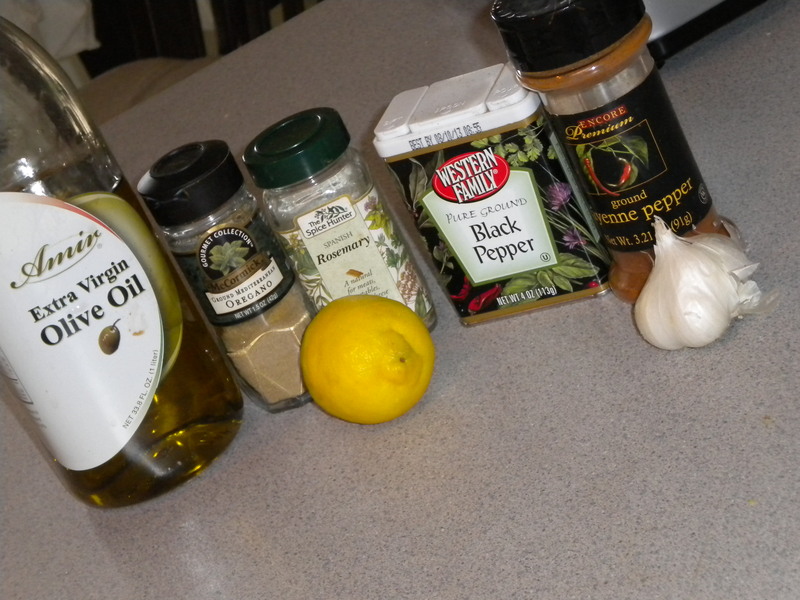 Posted on April 3, 2011 by Jenn C.
Method: Marinate chicken in spices, lemon juice, garlic, and olive oil. 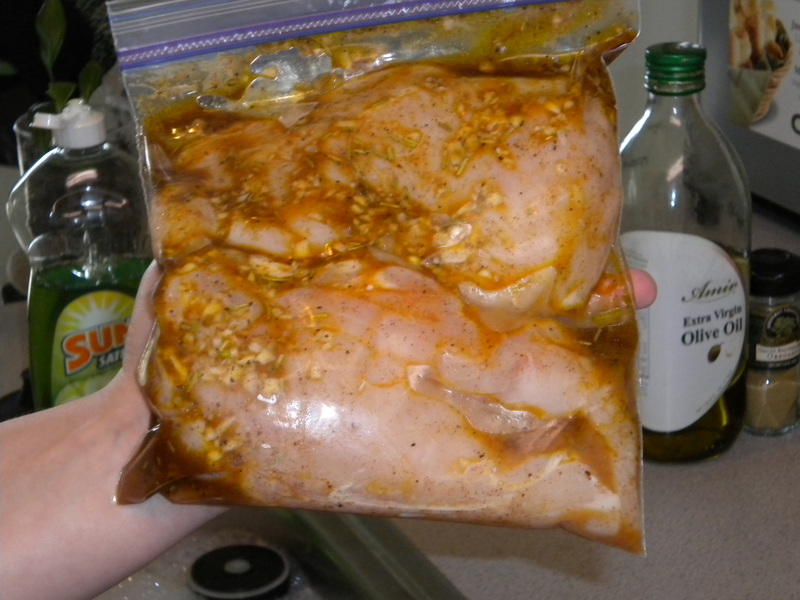 Zip-lock baggies are great marinating chicken receptacles. Slice red onion and spread it in a single layer on a baking sheet or casserole pan. 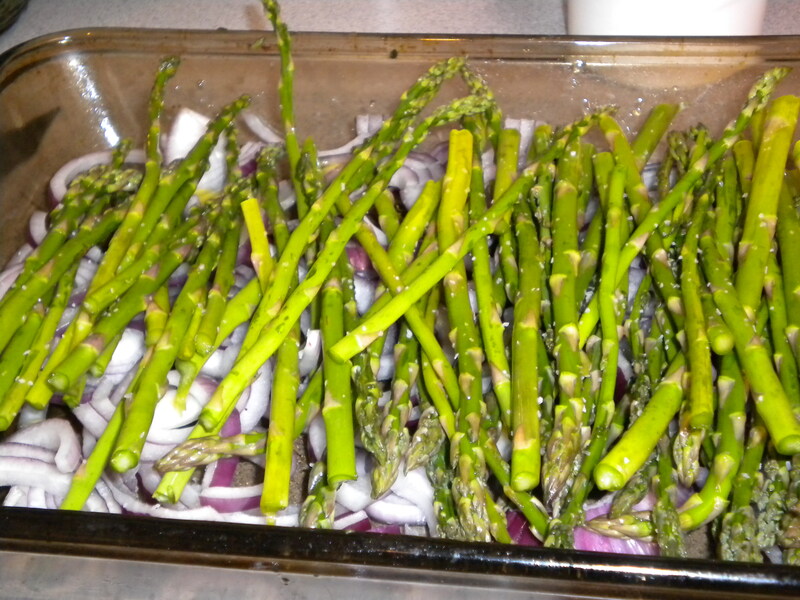 Wash and trim asparagus and layer it on top of the onion. 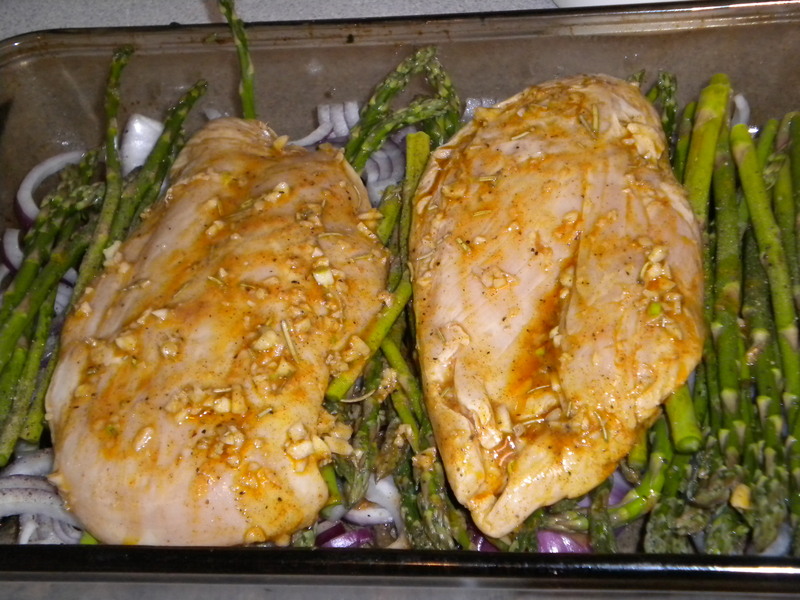 Place chicken and its marinade on top of the onion and asparagus. Roast at 400 degrees until chicken is done. 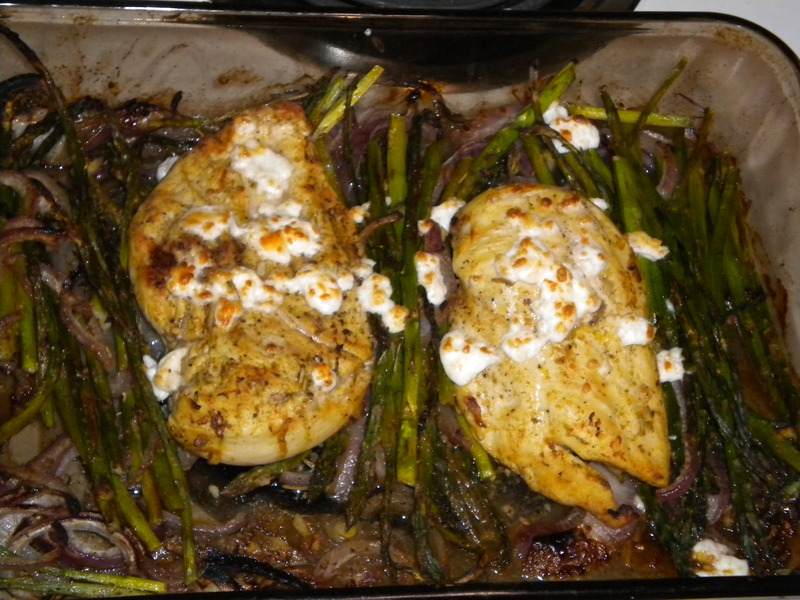 When the chicken is close to done, sprinkle feta cheese over the meat and vegetables and broil until bubbling and brown. Serve with pasta, rice, or whatever inspires you. 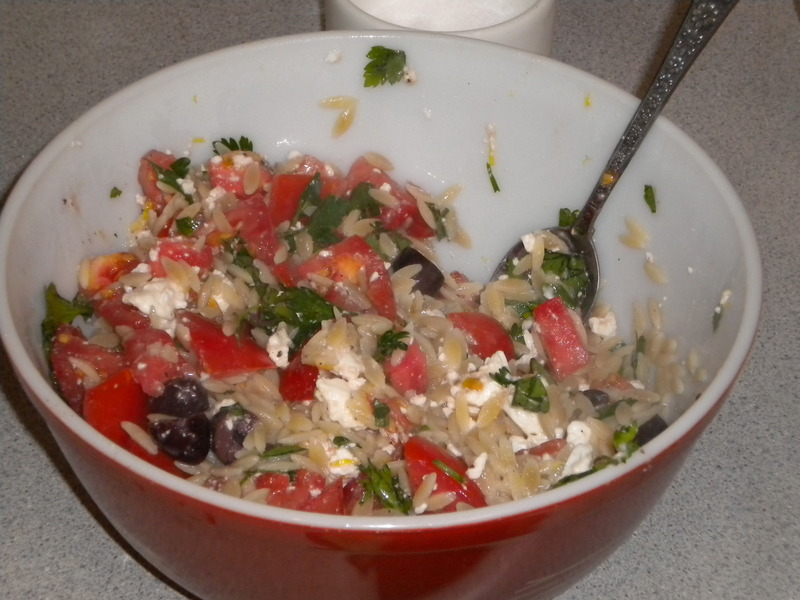 I made orzo with fresh tomatoes, parsley, lemon juice, lemon zest, feta, and olives.